Dustin Vaughn Warncke is an avid outdoorsman and an expert in sales and marketing with a specialization in the outdoor industry. From hunting ranches and other guide services to helping the launch of national retail products for the outdoor industry, Dustin has a passion for helping businesses grow and prosper. Dustin is an expert writer, speaker, web designer, marketer, video editor, and business consultant as well as an expert in many fiends in the outdoor industry. He has an unbridled drive for working with start-up outdoor industry products, small businesses, and large companies. In addition, Dustin also serves as marketing director and co-host for Mac & Prowler's Coyote Tales TV Show and has filmed and been featured in several TV shows featuring hunting-related products as well as rifle, shotgun, and archery "tech tip" segments. He also films, edits, and produces his own hunting and other outdoor adventures. Many of his video productions have been featured on regional and national television networks in the US. Dustin is also a regular contributor to www.macandprowler.com and www.thehuntingchannelonline.com well as other websites and blogs. 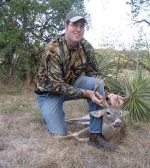 He also serves as a reporter and writer for Texas Fish & Game Magazine which is currently the largest independently owned outdoor magazine in the nation and the largest and most popular outdoor publication in the state of Texas, with circulation of around 100,000 paid subscribers.